It's our goal to fit you with the best hearing device possible for your unique hearing loss. 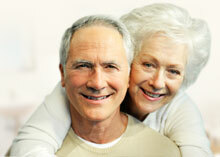 How long have you had hearing loss? What's changed with your hearing recently that's prompted your visit? These are some of the questions Dr. Fors will ask during your first appointment. We'll also have you complete a simple, one-page form so we have your contact information on file. Your first appointment will take approximately 30 minutes. Once we understand the history and nature of your hearing loss, we conduct a 10-minute exam to determine what your unique hearing needs are. (Most insurance providers cover a hearing exam every 3 years.) Following the exam, Dr. Fors will recommend a hearing device for you based on all the information she's collected. She or the support staff can answer any insurance questions you may have at this time. If you wish to proceed with Dr. Fors' recommendation, we invite you back within a couple of days to have your custom hearing device fitted. First, we make sure the device is comfortable for you to wear. Then, we do a "Real Ear" test that ensures the device will operate correctly in all kinds of environments - from noisy restaurant or quiet concert hall. The fitting concludes with full training on your device so you know exactly how to use it. As you get used to your new hearing device, know that we're available to you for ongoing care and support, whether that means hearing re-checks, subsequent "Real Ear" tests, or further device adjustments. We aren't satisfied until you're satisfied!